With many new brands on the market it’s confusing for owners to pick the best cart for their pet. So, since 2016 I’ve posted an annual review of the top U.S. manufacturers in the industry. Here’s our Dog Wheelchair Review 2019. And this year, you’ll see our first review of a new design from Europe. Disclaimer: This is my personal review of these products and I am not being compensated. I do have an affiliate relationship with HandicappedPets.com. You might be surprised to learn there’s more than one industry leader for dog wheelchairs. When my dog Sophie became paralyzed in 2008 I had only a couple of choices for her cart. It was a novelty and people starred at us when we took a walk. The story has changed today. Wheels for pets has gone mainstream. And social media is full of adorable videos showing dogs, cats, pigs, goats and even an alpaca flying around in their custom carts. That said, there are 4 dog wheelchair manufacturers that lead the pack. Each is a valued company that cares about the health and well-being of your pet as much as you do. They also understand the biomechanics of animals so the carts they build move properly with your pet’s body. This review gives you an overview of each of these companies and guidance about how to pick the best cart for your dog. Let it serve as a starting point in your journey to get your pet mobile again. Check with your pet’s veterinarian to be sure their health will allow them to medically benefit from a cart. And if possible seek a consultation with a veterinarian credentialed in rehabilitation who can evaluate your pet, properly measure and fit your dog for a cart, and provide the right physical therapy program so they will become accustomed to using their wheelchair safely. There are 3 basic designs of dog wheelchairs you should know. Each is built for a specific purpose to assist pets with different forms of mobility problems. Rear support wheelchair– This is the most common type of dog wheelchair. It has two wheels in the rear, a saddle for your dog’s pelvis to rest on, a harness to keep them strapped in and loops in back to keep their hind legs from scrapping on the ground. Dogs use their front legs and upper torso to walk around. A rear support cart is great for dogs who have hind end weakness or paralysis in their back legs, but have good strength in the rest of their body. A front support cart from Eddie’s Wheels. Front support wheelchair – This cart looks like a backwards wheelchair because the wheels are in the front and a dog uses their back legs to push themselves around. It provides support to a dog’s chest. Front support carts benefit animals who have problems with their front limbs. This can be due to a birth defect, an injury or after an amputation. A full support cart from Walkin’ Pets. Full support wheelchair or Quad cart – This dog wheelchair has two wheels in the front of the cart and two in back with support in the middle for a dog’s torso. Some of them look like little beds on wheels. They support all four limbs of an animal who is unable to move around or stand on their own. These carts are used most often for dogs with a neurological birth defect, after a stroke and dogs with end stage Degenerative Myelopathy. They are also used as a rehab aid after spinal surgery. If you’re confused as to which dog wheelchair best suits your dog, try this little test. 1. Can your dog walk comfortably using their front legs if you manually support their rear legs? Try doing it while you walk alongside your dog. You can use a towel as a sling under their lower belly for support. 2. Can your dog scoot or drag themselves across the floor using their front paws? If the answer is yes to both questions, your dog is probably a candidate for a rear support wheelchair. If not, another design might be more appropriate. Of course, you’ll want to confirm this with the professional companies listed below and with your veterinarian. 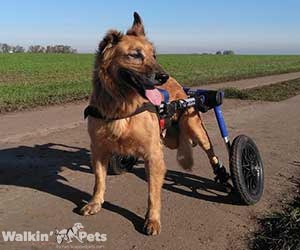 Walkin’ Pets by HandicappedPets.com offers the Walkin’ Wheels dog cart. This is a popular dog wheelchair because it’s lightweight, balanced, reliable and moderately priced. It’s also the only fully adjustable dog wheelchair that expands in length, width and height so it can grow with your dog. Owners select from a mini wheelchair that fits teacup breeds or sizes that fit small, medium and large size pets. Walkin’ Wheels adjusts with simple snap buttons and snap-in wheels to fit your dog. And it folds flat for transport and storage. Walkin’ Wheels can be ordered in a rear support design or as a full support wheelchair. HandicappedPets.com also manufactures custom carts for dogs that weigh less than 6lbs or more than 170lbs. Custom wheelchairs are offered in rear, full and front support designs. You can find Walkin’ Wheels on their website or on Amazon. The company also has an 8-week Rent-to-Own Program for pets who don’t need a dog wheelchair permanently. Eddie’s Wheels is owned by Eddie and Leslie Grinnell. This dedicated team has been building custom dog carts for more than 25 years. Their goal is to customize a wheelchair that meets the needs of each pet’s individual disability. Ed, who is a mechanical engineer, designs his sturdy carts for on and off-road play so pets can enjoy a good quality life. The company has won awards for their design which features a comfortable saddle and weightless harness. Leslie Grinnell said the key to the success of Eddie’s Wheels lies in the saddle. It’s padded and designed to match the angle of your dog’s pelvis. In addition, Eddie’s Wheels is known for their variable axle carts that enable owners to change the balance of the wheelchair to compensate for increasing weakness in a dog’s mobility. This feature has earned Eddie’s Wheels the honor of being selected by the American Association of Rehabilitation Veterinarians in their study on physical therapy for pugs with Pug Myelopathy. And as an unintentional benefit of the Eddie’s Wheels design enables some dog breeds with short legs to lie down while they’re in the cart. This is a big bonus. Eddie’s Wheels is a favorite among many pet owners. Their custom wheelchairs are built in rear wheel, front wheel and full support designs. If you’re looking for a used set of wheels, the Eddie’s Wheels posts a monthly list on their website for people who want a previously owned cart. And they house wheelchairs that have been donated back to them. These are not advertised online, but if one is available in the size you need, the company will refurbish it for a small fee and ship it to you. Click here to read more about how Eddie’s Wheels got their start. Disabled cats can benefit from a cart too. K9 Carts is the first manufacturer of dog wheelchairs in the U.S. Their design was created in 1961 by orthopedic veterinary surgeon, Dr. Parkes, after he saw a need for dog wheelchairs in his practice. The company is run by Barbara Parkes who’s been in the dog wheelchair business for 40 years. Each K9 cart is custom built individually to meet the needs of a pet’s disability. They build rear support and full support carts that are lightweight, durable and biomechanically correct. In addition, K9 Carts is one out of two dog wheelchair companies that offer a Rental Program and Rent-to-Own Program. Ruff Rollin’ is newest dog wheelchair company on the dog scene, but it’s quickly becoming a favorite by pet owners. Jason and Sierra Christofferson started the company in 2009 after they saw a way to improve on the conventional design of dog wheelchairs. Jason has more than 20 years of experience building and managing dog wheelchair companies. Ruff Rollin’ dog carts are durable, lightweight and custom built for the specific needs and size of each pet. The wheelchairs are also gender specific to make them as comfortable as possible. Ruff Rollin’ has built carts for a 1 ½ lb. Yorkie all the way to a 230lb. Mastiff and recently they built a full support cart for a miniature horse. The company builds custom rear support, front support and full support wheelchairs. Doggon’ Wheels is one dog wheelchair company you might not know because they pride themselves in being a small company. They have the unique distinction of being the most widely used cart by veterinary teaching hospitals and canine physical therapy rehab centers. The company was started in 1994 by husband and wife team Chad and Lori after their dog Benny was hit by a car. In addition to selling wheelchairs to institutions, Doggon’ Wheels also sells to the public. Each cart is custom made and comes in rear support, quad (full) support and front support models. Best Friend Mobility offers dog wheelchairs with a universal design that are reasonably priced. Veterinary orthopedic surgeon, Dr. William Vachon, created the design of these lightweight aluminum carts that are adjustable and come in five sizes and weight classifications. The company sells rear support wheelchairs and quad (full) carts. They can be ordered on Amazon and on the Best Friend Mobility website. You can also find them on Chewy. Pet parent reviews suggest the Best Friend Mobility carts work well for small dogs and older dogs that are less active. The company website also offers used carts for sale, factory refurbished wheelchairs and the SitGo cart. Last year Lessons From A Paralyzed Dog added our own way to help dogs get their paws on a set of wheels. We started a free Classified Ad page where pet owners can list a gently used cart they want to sell. Ads are posted for 10 days, so be sure to check back regularly to see new listings. The ad page is set up so buyers and sellers deal directly with each other. Modullo Dog is a brand new dog wheelchair company from Europe, but its founder Andrei Stoica has been working on the design for more than 6 years. With several paralyzed dogs of his own, Andrei worked hard to develop a strong, lightweight cart that’s comfortable for your dog on all terrains. Modullo prides itself on being safe, durable, easy to put-on and simple to adjust. And the cart is built with special springs so dogs can lie down to rest and get up again without a struggle. Modullo Dog Wheelchairs can be ordered through the company Facebook page. Dog wheelchairs are amazing, but don’t be discouraged if your pup doesn’t immediately warm up to their cart. When I strapped my dog Sophie into her wheelchair for the first time, she immediately tipped the cart on its side. Walking in a cart takes practice for some dogs. A good tip is to go for short walks on a flat surface until your dog builds up confidence. A second important point to keep in mind is that dog wheelchairs are best used for exercise and playtime or when your pup goes for walk. They aren’t designed to be worn 24 hours a day. Dogs can’t sit down to rest in a typical wheelchair and because you’re dealing with a dog that has special medical needs, giving them ample time to rest is important. Linda, Thanks for sharing your experience. You were lucky to a great company like Eddie’s Wheels so close by. Pet owners reach out to me all the time with the vague idea that a cart will help their dog, but they don’t know where to begin their search so I write this annual review to guide them through the process. Thank you for your appreciation of Modullo! We’ll try to live up to these promises! I really love to get the news letter and read the post on your blog. My girl has been paralyzed for over 2 years and now gets the UTI and yeast issues. I have tried some of your Technics and they are very helpful. Debra, Thanks for the kind words about my blog. And thank you for pointing out Best Friend Mobility makes quad carts. I will update this story. Kathryn, Thank you so much for letting me know about your group. I am happy to add Wheels to Help Me’ to the list. Your group will be the first to have a branch in the UK. Now you’ve given me two resources. I’ve looked for a DM page on Facebook because readers ask me where they can get ongoing support. There was an active group when my dog was sick, but it appears that one has ceased to exist. That will also go on my resources pages.